Marketing personas can be a powerful tool. However, for them to be useful you don’t just make them and check them off the list. You need to keep them in mind any time you write copy. Let’s discuss what a persona is, why you should use one, and go over how to create them. A marketing persona outlines the exact person you’re trying to reach. The persona is a profile that describes the demographics, goals, and frustrations of your target audience. Personas help you talk to your targeted audience, and help you target ads. With a persona, you know exactly who you are talking to. So, in all of your copy, whether it’s a blog, product page, or an ad, you are talking to the exact person you want your message to resonate with. This allows you to amaze and delight one person, instead of boring everybody. If you write copy to try and appeal to everyone, it will be vague and uninteresting to all. Conversely, if you are talking to one individual person, you can be very specific and speak their language. Talking to that one person you care about is how you will be able to write persuasive copy that actually converts. How Do I Make a Persona? You want your persona to tell a story. Add enough detail to your persona that you get a clear image in your mind of the customer. Download this marketing persona Google Sheets template to get started fast! Start by looking at the data you have. Google Analytics, Facebook, and Twitter can all provide valuable insights. 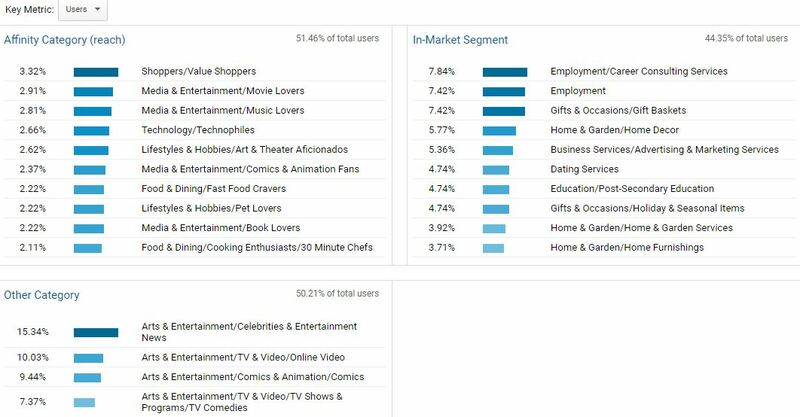 Go to your Google Analytics account and look at the demographics and interests. To view the demographics, go to Reports > Audience > Demographics > Overview. This will show you the age and gender of your users. To view interests, go to Reports > Audience > Interests > Overview. This will show you categories of various interests your users may have. To view Insights, go to your Facebook company page and click the Insights tab at the top. Click on People to view demographic data such as age, gender, location, and language. Sign in to Twitter Analytics. Click on Audiences at the top. This will show you gender, interests, and location data for your followers. Talk to your employees. Specifically the ones who interact with customers such as support reps. Find out who they are talking to and who they see as the ideal customer. Send out a survey to your existing customers. Ask demographic information such as age and gender and also business information such as job title. Once you have your data it’s time to put it all together. This is when you’ll actually create your personas. The fields you add to your persona will vary depending on your business goals and the data you uncovered. This field only requires a Yes or No response. If this persona is not a decision maker, you’ll want to create an additional persona for the person who will be responsible for making the decision. You’ll want to make sure you have copy in place to convince both parties. Where does this person look for information? Are there specific websites or locations they frequent? How can [company] offer support? What can your company do to help this person accomplish their goals and overcome their frustrations? Ready to create your personas? Simply fill in the blanks with this Google Sheets marketing persona template. These fields are a good place to start. Add or remove any items you’d like until you can clearly visualize your customer. Are there any additional fields you like adding to your personas? Let us know in the comments! We all know that content is king. And, to rank well in Google search results, your site needs to have high-quality content. Creating the level of content that is required to dominate the search results is tough work. That’s why, when you create a content piece that is successful, you should repurpose it by modifying it to take advantage of other content formats. Let’s look at Disney to get a better idea of how this tactic works. Before we get too far, let’s talk a bit about what it means to repurpose content. Repurposing content is the act of changing one type of content to fit into another content format. Typically this tactic is specifically used on your top performing content pieces. For example, if your top blog post is a list article on the Top 5 Beers to Drink with Chocolate Chip Cookies, you can repurpose it by creating a video using the information in the article. You can also take the content and create an infographic so the content can easily be viewed as a graphic. When you repurpose it in this manner, you can get your content in front of a larger audience by putting the content on a channel appropriate for the content type. In the prior example, the original blog would be on your company website, the video could be on YouTube, and the image can be on Pinterest or Instagram. You can even break the infographic into 5 small images to highlight each list item. The video and infographic can live on your company website as well, but adding them to additional networks will provide you with exposure to an audience you may not have otherwise had. So… What Does Disney Have to Do with Repurposing Content? Of course, Disney is amazing at everything they do. But, whether you realize it or not, Disney is also the master of repurposing content. You may be thinking of all of the merchandise and toys related to their movies. Granted, the merchandise is a smart move on their part, however, for the purpose of this article we’re going to look specifically at content and media formats. What happens when Disney creates a successful movie such as Finding Dory? They take that same great story that people loved, and repurpose it into additional formats for more people to enjoy. You can buy five different Finding Dory books, they all have different covers, they are different sizes, and they appear to be different books. The question is, do they include different stories? Do they have more backstory or are they short stories that just use the same characters? The answer is, no, they are all the same story. It’s the story that has already proven to be a winner but told in a format that the user wants to view. Let’s dig deeper into these five different books and figure out how they were able to create so many different products using the same story. Board Book – The first book is a board book. This is an extremely simplified version of the story meant for a very young audience. Coloring Book – The next book is a coloring book. This format has a few more words than the prior format but it still only has one sentence on each page. It’s the same story, but on a format that allows for coloring and enjoying the story in a different way. Sound Book – The sound book format continues the trend of offering a book for a young audience, and keeps the same successful story, but adds buttons to hear sounds during relevant places of the story. This allows for people to not only read but also hear parts of the story. Additionally, they get to interact and participate by clicking the buttons during the appropriate part of the story. Paper Book – Moving to an older audience, you can get the story as a book with paper pages. The pages have more words on them and the content is longer than the prior formats, yet it still consists of the same overall story. Collector’s Edition – The Collector’s Edition is yet another format with the same great story. This version can be loved by children and adults alike. This format has a classic and expensive look with silver lined pages. The stories are longer than any of the prior formats, but again, it is the same story. Not only can you find numerous storybooks to portray the same story, but you can find multiple movies. Disney has been re-releasing some of the classic movies as remastered digital Blu-rays. This is a new format to consume the same content you loved before. Why would people buy the same movie again? Because the new format is easier and more enjoyable to consume. You can now see Disney taking this a step further. If you look at Beauty and the Beast, you have the classic animated movie and now you have a live action (non animated) version. Again, the new version uses the same great story that has already proven to work. The changes are fairly subtle to make the story work with the new content format. How Can Disney Make So Many Different Formats and Not Annoy People? Simple, they understand their demographic. They understand that their content is loved by people of all ages and they make sure there’s a format available for the wide range of users. They also understand the level of attachment their users have towards their content. They’re able to leverage the nostalgic feeling of their stories to justify additional formats. The feeling of nostalgia is what helped the live action Beauty and the Beast to be so successful and why they need to provide so many formats for the younger audience as parents want to introduce these stories to their children in a format their child will love. What Can We Learn From Disney? Have a method to introduce your content such as a blog on your company website. Identify which content pieces are popular and enjoyed. Identify different formats your audience regularly uses to consume content. Repurpose your top performing content to leverage those additional format types. Creating content is important, but let’s face it, sometimes it’s difficult to come up with new content ideas. When you get to that inevitable stuck point, review this list to help trigger your next brilliant content idea. Seeing as how this very article is a list article (sometimes referred to as a listicle) it seems to be a fitting item to start off our list. Creating a list article is simple, you choose a topic that allows you to outline multiple options. Each of those options then become a list item. The articles almost always start with a number such as 9 Incredible Ways To…, 16 Super Simple Things You Can Do To…, or The 6 Cheapest Tools To…. Titles with a number have also been shown to be one of the most commonly shared pieces of content on social media. Every industry has myths. Highlight some of the common myths and reveal the truth behind the myths. You can also take the opposite route and create an article about facts. Or, you can mix the two together with an article that lists statements and then reveals if each item is factual or a myth. There are a ton of bizarre holidays. From National Beer Day to Hairstyle Appreciation Day there is a bizarre holiday to fit almost every industry. Review the bizarre holidays and identify any that can be related to your business. Keep track of those holidays on your editorial calendar. You can create a content piece around that topic and inform your readers about the holiday. Interview experts in your industry. For your content piece, you can interview one or more experts. A popular method to gather this content is to prepare you questions ahead of time. Then determine the experts you’d like to interview. Contact them either via e-mail or social media and explain the situation. Let them know that you’re writing an article about a particular topic and you’re looking for experts to share their opinions. When your article is finished, reach out to each expert referenced in the article. Thank them for participating and provide the link. They will typically want to share the interview with their followers. Create a useful resource specific to your industry. Create a glossary defining terms, acronyms, and jargon commonly used in your business. Or, you can choose a specific topic within your business and create a complete guide explaining exactly how to do that particular item. If you decide to create either of these content ideas, make sure they are detailed, beautiful, and meaningful. If they are, they will get shared and be a wonderful source of backlinks. Create a content piece using unique research. The simplest way to do this is to send a survey to your users and then share the results in an article. You can also share a case study. Interview a user that has been very successful with your product and outline the experience and successes. Users naturally want to share this type of content with others. Review items related to your field. This can be applied to physical items or digital items. You can review apps, software services, or physical goods. You can write an extensive review on one item, or create a comparison guide which reviews the pros and cons of multiple similar items. Infographics combine data with visuals. Infographics are shared more often than list articles. You may already have content with a lot of data that you can build into an infographic. If you don’t have design experience, you can build an infographic easily using Canva. How do seasonal trends affect business in your industry? Are you in the health or beauty industry? How do the seasons affect skin care or allergies? And for the automotive industry there are all kinds of seasonal tips for your car and safe driving. There’s also the more obvious seasonal trends such as the holiday rush for your e-commerce shop or the nice summer weather for your sporting goods store. Write content specific to the time of year. Try and write this towards the beginning of the season so you can share it throughout the season. Keep your audience up to date with the industry in general. Things are always changing, make it easy for your users to stay up to date on current trends and best practices. Need even more content ideas? Share current events and highly discussed news stories. Give your opinion and unique point of view on the situation. Don’t just copy and paste the same story but add value to it. You can also write content highlighting updates to your product. Of course, you only want this to be a small percentage of your content. However, it is valuable for your users to stay updated with changes to your product. It could also be beneficial to create tutorials and guides to help users get the full potential out of your product features. Hopefully these content ideas will help provide inspiration for your next post. Do you have an idea for an article not mentioned on this list? Let us know in the comments.